Here are two fool-proof ways to easily find the major pentatonic scale-tones in any key. Watch the introduction, then dive in. Here's the video describing the 'scale' method of finding the major pentatonic scale-tones. Here's the 'counting semitones' method. 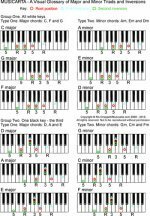 Now watch the two methods being applied to find the D flat major pentatonic scale-tones. The C, F and G pentatonic major scales use only the white piano keys. Work through the method two-handed following the green-for left hand/orange for right hand colour coding. Say the scale-tone names (tonic, second/2, third/3, fifth/5, sixth/6) out loud every time!